In the interest of transparency, information on the IANA transition costs is provided on this page. 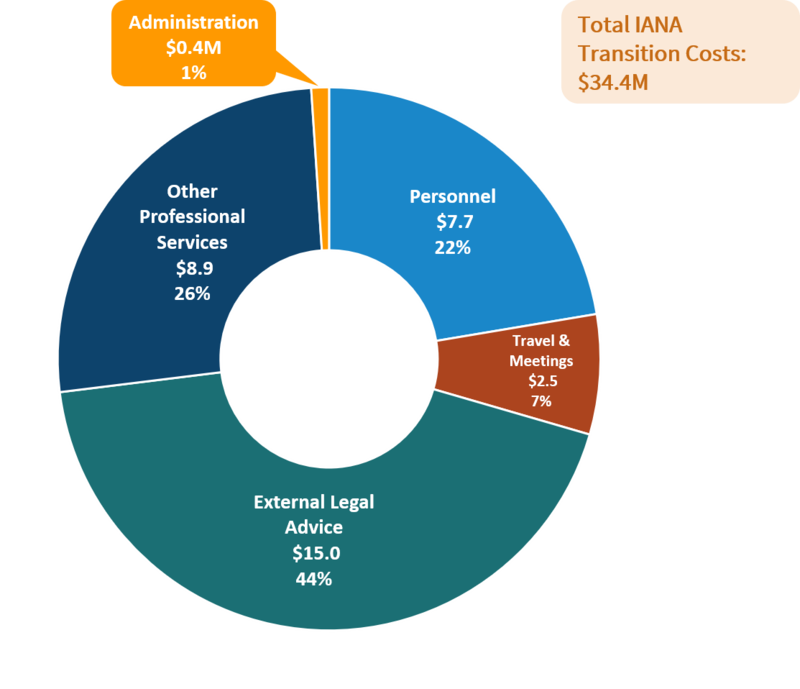 The scope of the costs included here includes the IANA Stewardship Transition Coordination Group (ICG) work, the Cross Community Working Group on Naming Related Stewardship Functions (CWG-Stewardship), the Cross Community Working Group on Enhancing ICANN Accountability (CCWG-Accountability) and any implementation work. The cost categories include the cost of staff support, travel and meetings costs, professional services (including legal advice), and administrative costs. The costs disclosed are exclusively direct costs and do not include any overhead allocation. In agreement between the Board Finance Committee, the leaders of the SO/AC Chartering Organizations and the co-chairs of the CCWG, the Project Cost Support Team (PCST) was set up as a support function to the CCWG co-chairs for cost management purposes. The PCST supports the project planning, providing costs information and analysis, and supporting forecasting. to the chartering Organization and to the public for transparency and accountability: all expenses of the project. For the IANA Transition project, ICANN has identified staff members involved in the project in a significant fashion. Significant is determined on the basis of an estimated percentage of time spent on the project at or exceeding 10% and can be as a result of an on-going activity carried out on a partial basis, or a dedicated full time effort during a limited period. The information in this section contains data concerning supported travelers as it relates to attending various IANA Transition related face to face meetings. The costs included in this section are also included in the Costs Summary documents above but are focused on the legal advice incurred by ICANN with each of the three legal firms employed: Jones Day, Sidley & Austin, Adler & Colvin. Note: When monthly invoices have not yet been received, estimates are requested from the legal firms. If no estimates are received from the legal firms, ICANN Finance produces an estimated monthly total cost, mainly based on historical trend. The information in this section provides a more detailed understanding of the Professional Services expense category, included in the above summary information, for the period specified in each document below. The table below indicates, for each type, the names of the vendors who supplied the services rendered. The Professional Services include Legal Advice Costs, which are disclosed in further detail in the preceding section.